The family of aperture load balancers are characterized by their selection of a subset of backend hosts with which to direct traffic to. This stands in contrast to P2C which establishes connections to all available backends. In Finagle, there are two aperture load balancers, random aperture and deterministic aperture which differ in how they select the subset of hosts. The Random Aperture load balancer was developed to reduce the number of connections that clients will establish when talking to large clusters. It does so by selecting a random subset of backends to talk do under normal conditions with some slight changes under extraordinary conditions. This a positive effect for both clients and servers by reducing the connections between them but comes with the cost of load banding. Because clients choose which servers they talk randomly, it’s possible that some choices of the minimum number of peers to talk to will cause some servers to have more clients than others. Assuming that clients in a cluster produce the same amount of load, this means that some servers will have more or less load than others. This makes it harder to reason about a clusters overall capacity, overload scenarios, and failure modes because servers are no longer uniformly loaded. Service A connecting to Service B using random aperture. The number of connections are reduced but there is an uneven number of connections per service B host due to the statistical nature of service A picking hosts randomly. The distribution can be used as a guide for how to choose the number of remote peers per client. Since the binomial distribution starts to turn Gaussian as the increase the number of trials, properties of Gaussian distributions can be used to reason about the binomial distribution (note that it’s worth checking that the graph looks reasonably Gaussian before using these rules of thumb). In a Gaussian distribution, approximately 1/3 of the servers will be < (mean - stddev), and approximately 1/3 of the servers will be > (mean + stddev). This can be used to extrapolate the distribution of connections per host. Wolfram Alpha is a good resource for visualizing the behavior of a binomial distribution for different parameters. Let’s say that there exists a service called “Brooklyn” that has 1000 nodes in its cluster which is configured to use the aperture load balancer to connect with a service consisting of 5000 nodes called “GadgetDuck”. The goal is to pick the minimum number of connections that will result in a ~20% or less difference between the low and high load bands. As an initial value for exploring the distributions, the asymptotic value of 1 is used as the aperture size. Using Wolfram Alpha, the mean is found to be 5, and the stddev will be 2.5. This distribution is too wide to satisfy the 20% difference requirement, so the next step is to increase the number of remote peers to 10. Wolfram Alpha computes the mean and stdev of the new distribution to be 50 and 7, respectively, which is still too wide. A third attempt using 100 remote peers yields a mean of 500 and stddev of 22 which is within the requirements. Thus, an aperture size of 100 or more will satisfy the load banding requirement. Further iterations could be used to shrink the aperture size to a value in the range (10, 100] that still satisfies the banding requirement, if so desired. Deterministic aperture is a refinement of random aperture that has better load distribution and connection count properties. Like random aperture, deterministic aperture reduces the overhead of clients for both clients and the servers they talk to by only talking to a subset of service instances, unlike P2C which lets the client pick from any replica in the serverset. However, unlike the classic aperture implementation, it does so using a deterministic algorithm which distributes load evenly across service instances, reducing the phenomena of load banding which is inherent to the statistical approach employed by random aperture. This facilitates a further reduction in necessary connections and manual configuration. Deterministic Aperture is the default load balancer at Twitter. The variance in requests per second (RPS) is significantly diminished after the service A deploy due to the deterministic load distribution. The total number of connections from A to B was significantly reduced. Deterministic aperture combines information about both the backend cluster as well as the cluster information for the service at hand and partitions connections to backends in a way that favors equal load and minimal connections (with a lower bound of 12 to satisfy common concurrency and redundancy needs). 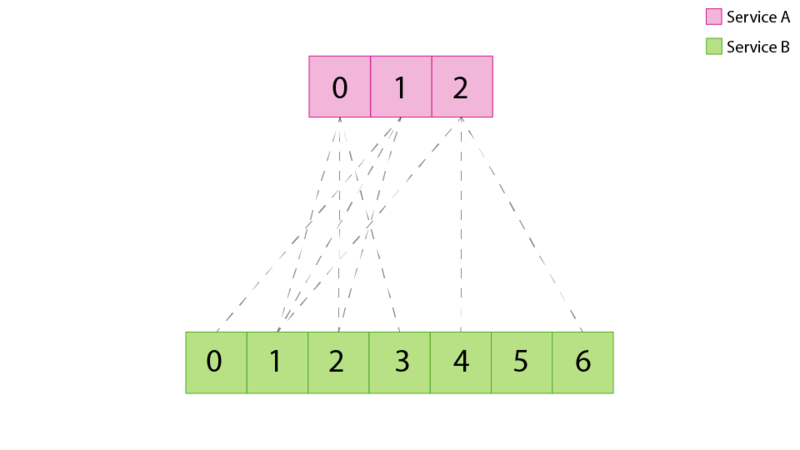 It does this by letting each member of a cluster compute a subset of weighted backends to talk to based on information about each cluster. 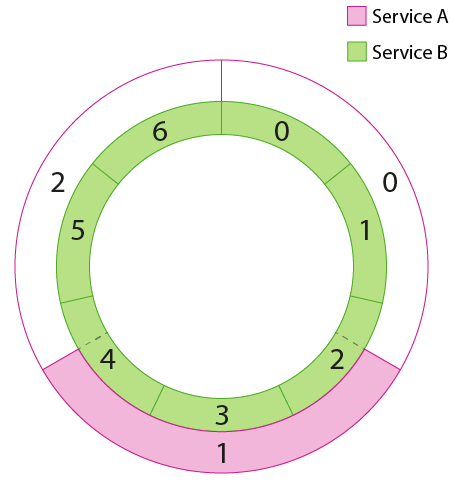 This can be visually represented as a pair of overlapping rings: The outer ring, or “peer ring”, represents the cluster of peers (Service A) which are acting in concert to offer load to the “destination ring” which represents the cluster of backends (Service B). Each instance of Service A determines which “slice” of the backend ring to talk to and directs its traffic to those specific instances. Since each client instance is doing the same thing, except picking the slice that belongs to them, we can evenly load the backend cluster (Service B). 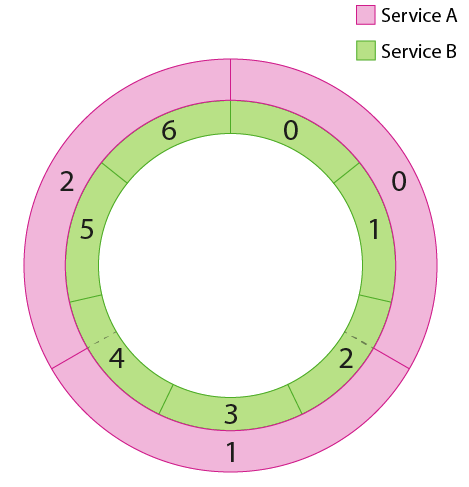 Note that this requires the load balancer to respect the continuous ring representation since peer slices may cover fractional portions of the destination ring. The deterministic aperture model, and subsetting models in general, works well when the traffic pattern between service A and B is “smooth” meaning that for each instance of Service A the request pattern doesn’t consists of significant bursts with respect to the average request rate and that requests are roughly equal cost, both in resource usage of the backend and in terms of latency. If the traffic pattern is characterized by large bursts of traffic, say invalidation of a cache based on a timer, then small chunks of the ring will end up extremely loaded for the duration of the burst while other slices may be essentially idle. Under those conditions the P2C load balancer may be more appropriate so the entire backend cluster can absorb the large bursts coming from instances of Service A. How many replicas are there in the peerset. This is used to compute how large each clients slice of the backends will be. What is the position of this instance in the peerset. This is required to compute which slice that this client should take. This information can be configured in the ProcessCoordinate object by setting the processes instance number and the total number of instances. The current implementation requires that all instances in the cluster have unique and contiguous instance id’s starting at 0. Success rates and exceptions should not be affected by the new load balancer. Other important metrics to consider are request latency and connection count.